Romantic, maybe, but tacos just have that effect on their devotees. 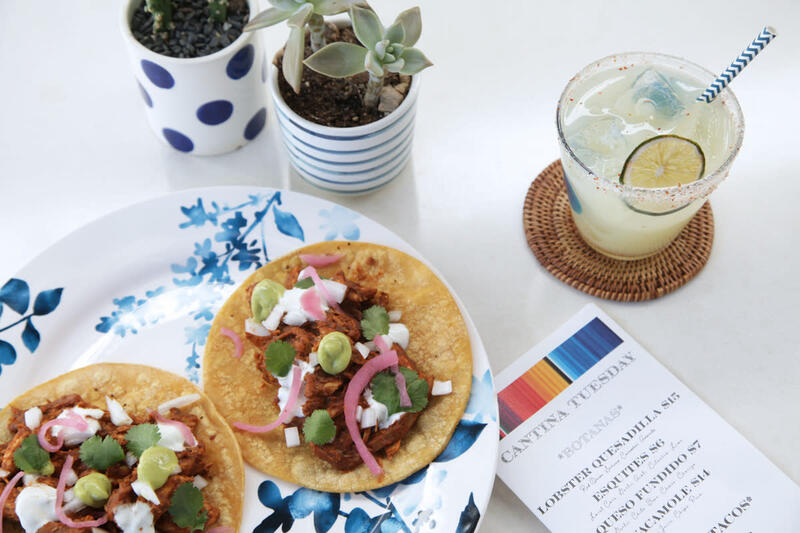 Lovers of tacos are in luck when it comes to dining in Greater Palm Springs, with so many great options that it was tough to whittle down our list of favorites. La Bonita’s is a good place to start. A relative newcomer to the desert taco scene, having opened about four years ago in downtown Palm Springs, the tiny restaurant has quickly become a popular spot for casual Mexican fare. The traditional soft tacos are excellent (particularly the carne asada), but for something a little different try the “Double Shell Bonita Tacos,” featuring a soft corn tortilla topped with melted cheese, wrapped around a hard shell taco filled with carne asada or chicken, salsa, lettuce, pico de gallo and sour cream. Watching your carb count? Ask for the off menu “Cheese Shell Taco” – the shell is made from either just crispy fried cheese or you can make it a “hot cheese shell” with the addition of crushed flaming hot Cheetos. 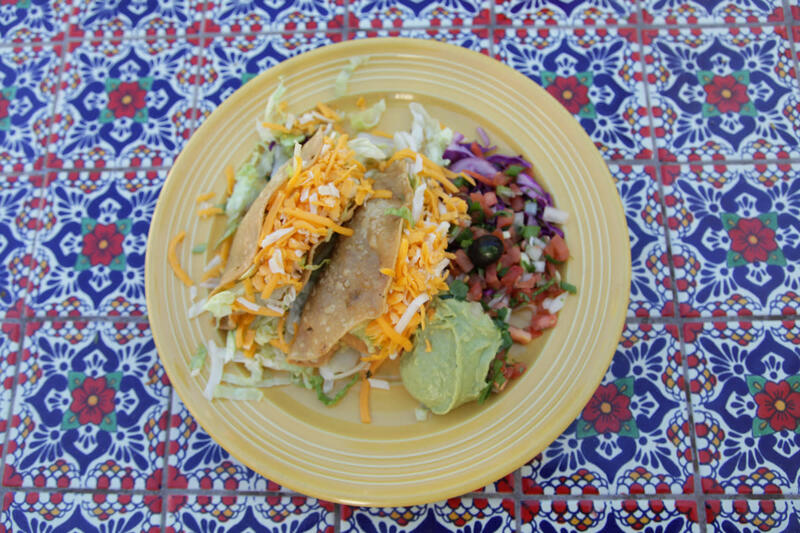 Enjoy your tacos alfresco on the beautiful patio at Las Casuelas Nuevas, a family-owned restaurant in Rancho Mirage since 1973. Both the hard shell and soft tacos are great, and for an appetizer riff on the taco, try the delicious flautas (rolled crispy flour tortillas lined with cheese and shredded beef or chicken, topped with cotija cheese, crema fresca, pico de gallo and served with creamy chipotle sauce). 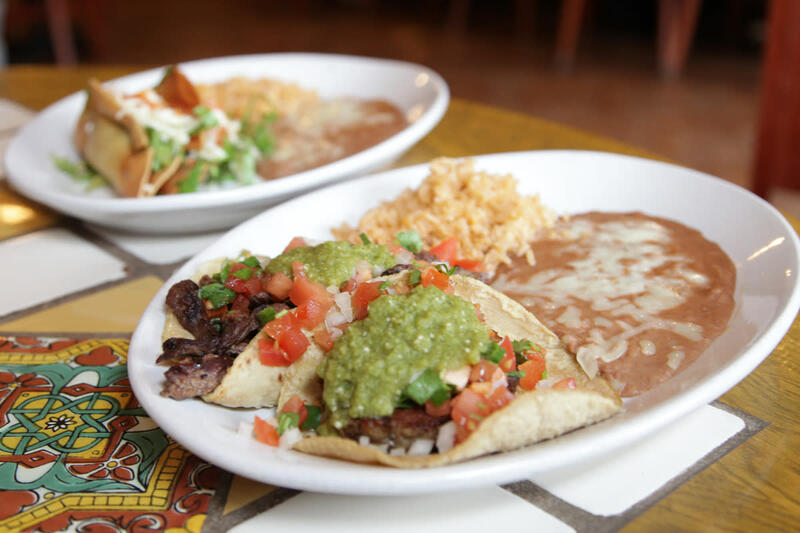 At Fresh Agave in Palm Desert you can order a “Taco Fiesta for Two,” which includes carne asada, pollo asado, carnitas, chorizo, guacamole, pico de gallo, sour cream, jalapenos and cheese, served with your choice of corn or flour tortillas. The Pantry at Holiday House hotel in Palm Springs has recently started Cantina Tuesdays, featuring excellent street tacos, margaritas and other Mexican fare. Need a break from tacos? Try the lobster quesadilla and queso fundido! In the mood for something a little different? Tonga Hut in downtown Palm Springs specializes in Polynesian cuisine, and they put their own spin on Taco Tuesday with Tiki Taco Tuesdays, when you can enjoy your choice of three tiki-themed tacos and a Mai Tai cocktail for just $12 from 5-10pm. Another spot for a good Taco Tuesday special is The Grill on Main in Old Town La Quinta, where tacos are $3.50 from 3-6pm each Tuesday, along with discounts on cocktails, wine and beer. Taco fillings include shaved ribeye, fried shrimp, grilled fish and beer-battered fish. 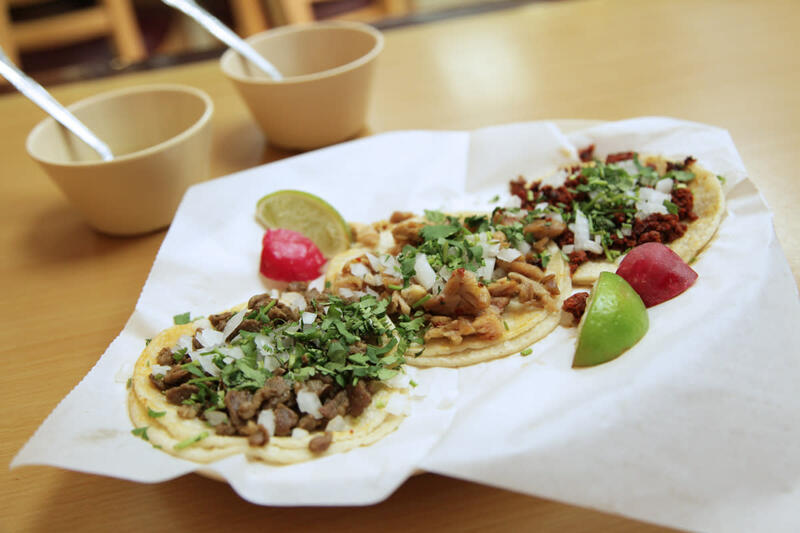 Tacos Gonzalez is an unassuming gem in Indio, where street tacos are just $1.89 each for al pastor, carne asada, pollo asada and chorizo, and $2.29 for carnitas. More favorites include El Mirasol (two locations – north and south Palm Springs), Las Casuelas Terraza and Las Casuelas Original in downtown Palm Springs, Maracas Mexican Cantina & Grill (two locations – Palm Springs and Rancho Mirage), Casuelas Cafe in Palm Desert and Rio Azul in Palm Springs. Ace Hotel & Swim Club in Palm Springs has eschewed Tuesdays for Thursdays with “Taco Jueves,” featuring a taco, chips, salsa and a margarita for $14 on Thursdays from 5:30pm to close in King’s Highway, Amigo Room and poolside. Also embracing Thursdays are El Jefe at the Saguaro Palm Springs and Taqueria Guerrero in Indio. 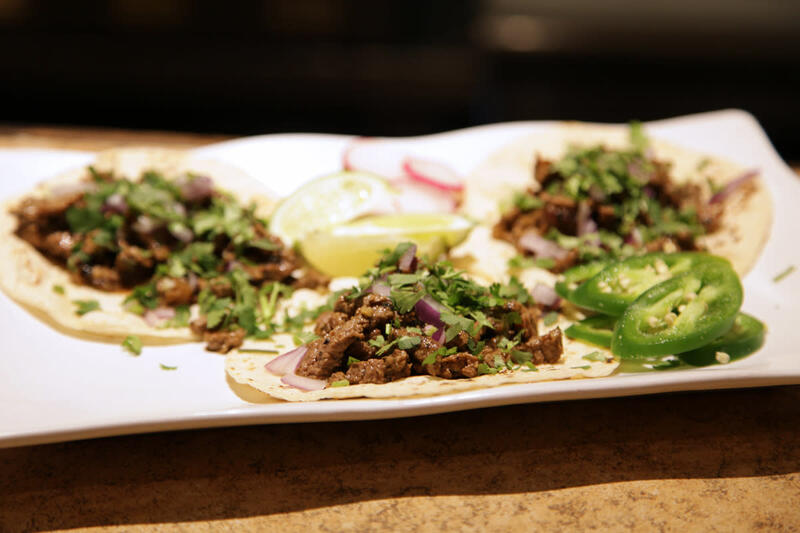 Both spots offer their taco specials on both Tuesdays and Thursdays – 6-9pm at El Jefe with $4 tacos and discounts on margaritas, sangria and beer, and $1.25 tacos all day at Taqueria Guerrero. We didn’t forget about you, vegans and vegetarians! The all-vegan menu at Native Foods in Palm Springs includes Baja Tacos with blackened tempeh, creamy chipotle sauce, salsa fresca and shredded cabbage. The aforementioned El Jefe has a nice veggie option (heirloom roasted carrot tacos with house-made requeson cheese, cotija, arbol sauce and toasted sesame seeds), as do El Mirasol (spinach soft tacos on corn or flour tortillas) and Fresh Agave (veggie tacos with sautéed carrots, zucchini, mushrooms, jicama, broccoli and spinach, topped with lettuce, cheese and avocado). If you’re heading out to the high desert, stop in at Crossroads Cafe in Joshua Tree, where they serve the “Hot as Hell Taco” (seitan, onion, peppers, chipotle sauce, cabbage salad, salsa, avocado). Are you continually searching for the ultimate fish taco? The Baja Fish Taco at Shanghai Reds in Palm Springs is excellent, and we’re not the only ones to think so – in fact, the taco was once dubbed by Anthony Bourdain as “truly exceptional” (fresh Alaskan cod, beer-battered and fried, topped with shredded cabbage, pico de gallo and their special white sauce). Also available (and tasty!) are their shrimp tacos (grilled or fried) and seared ahi tacos. The fish tacos are great on the lunch menu at Citrus & Palm in the Miramonte Indian Wells Resort & Spa, as are those at Chúla Artisan Eatery in La Quinta, which are topped with pineapple salsa, garlic crema, jalapeno jam and pickled cabbage. Just when you think you’ve got a good feel for the local taco scene, more recommendations come your way! On our must-try-soon list is La Noria in Coachella, which we hear is outstanding. Have a favorite spot that we missed? We’d love to hear – leave us a comment on Instagram! Katy Carrier is the founder of Palm Springs Style, a lifestyle company started in 2013 that includes digital and print media, special events and a retail store in the Uptown Design District of Palm Springs. She was drawn to the Greater Palm Springs area through her love of midcentury architecture and design and the gorgeous desert landscape. Katy is a graduate of the University of North Carolina at Chapel Hill School of Journalism and Mass Communication, as well as Tulane University School of Law.